Whether it's the middle of winter or the height of summer, making sure kids get outside for some good old-fashioned play is vital to their health and development. Not only does this ensure that they get regular exercise, but outdoor fun gives kids the opportunity to explore, learn new games and make friends. Heading to a local playground is a great way for kids to cut loose, but don't leave home without keeping these safety tips in mind. As a parent, it's vital that you keep a close eye on your children while they use the playground. Be on the lookout for signs of risky play, bullying, bad behavior and improper use of equipment. Kids often like to roughhouse and push the limits of acceptable fun, so make sure you can intervene in a moment's notice should things get dangerous. As mentioned above, children often like to make up their own rules on the playground, which could mean running up the slide backwards or trying to swing up and over the bar. Because of this, it's your job to educate children about proper equipment use so nobody falls off the monkey bars, pinches their hand in a seesaw or collides on the swing set. As children get older, they may not realize that they're too big to play on the same playgrounds designed for younger ones. Separate the big kids from the little to make sure everyone can play safely. 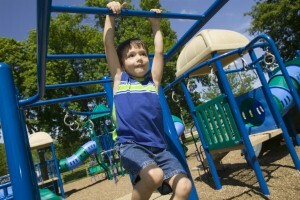 You may also want to keep older children from using playgrounds meant for toddlers, which can result in them getting stuck or breaking the equipment.